The rich natural resources of Australia offer furniture designers and builders a wealth of beautiful and durable hardwood varieties, including Alpine Ash, Messmate and Tasmanian Oak along with the option of FSC sustainable timber. Attractive repurposed woods are from varied sources like used timber flooring, crates, furniture and general construction, both residential and commercial. Using this recycled timber to create new furniture pieces for home furnishings such as cabinets, beds, bureaus, night stands, lounge chairs, bar stools or dining room table and chair sets helps reduce useless piles of discarded timber and old wooden furniture in landfills. It also cuts down on the need to harvest more woods from today’s forests, thus saving one of our planet’s most valuable natural resources. • Unique Beauty and Known Durability. – Australian hardwoods are well-known for their unique beauty and their outstanding colour variations, diverse grains and varied textures. Repurposed timbers of all types are well-seasoned and often display even more elegant grains and stunning colour variations than newly harvested woods. Since Australian hardwoods are known to be among the longest lasting in the world, there is no need for concern about the ongoing usability of these recycled woods for crafting new furniture pieces. • Eco-Friendly Building Material. – Using recycled timber for new furniture designs today is making good use of environmentally friendly building materials. Instead of creating new cabinets and other furniture items using wood laminates or plastics that are not biodegradable, making new cabinetry and furniture from repurposed timber helps save the environment while putting older, secondhand hardwoods to good use. • Cost-Effective Recycled Wood. 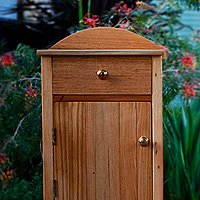 – Making new cabinets and furniture from recycled timber today is both practical and cost-effective. Since repurposed wood is still often viewed as second class building material, wooden cabinetry and furniture pieces created from recycled timbers can be much less expensive than those crafted from freshly harvested timber. When you contact Peter Wenborn of Wenborn Wood, serving Melbourne and the surrounding areas, you will receive top-tier advice, information, design and wood crafted cabinets and furniture pieces, each made from beautiful and durable reclaimed timber of varied types. All joinery for your cabinets and furniture pieces will be traditional and of finest quality, without use of nails, screws or staples unless handles and hinges are needed. Your newly designed and created timber furnishings will be custom designs built using beautiful, well-seasoned hardwoods. Each item will display unique grain patterns, varied textures and rich, radiant colours and finishes to suit your specific preferences and satisfy your decor requirements with artistic brilliance to ensure lasting appeal.